Halloween is one of our favorite times of year, and we just can’t wait two more whole months for it! 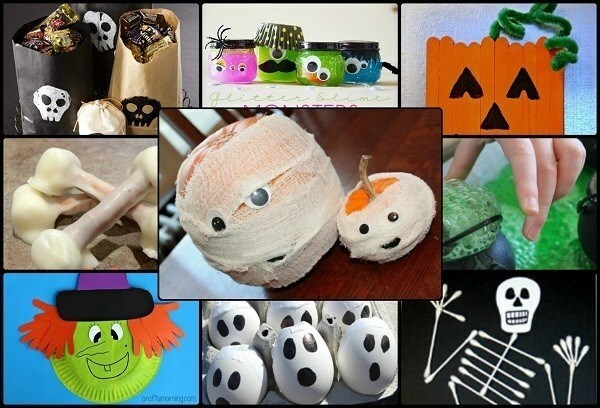 So to get you as excited for Halloween as we are, we’ve collected a wide selection of the best Halloween themed crafts for kids. From simple projects made with common household supplies or craft paper and paint to more involved crafts that you’ll want to help out with, you and your kids can make a whole host of spooky indoor and outdoor decorations that your kids will love. You’ll definitely want to save some of these crafts to put up in the years to come! 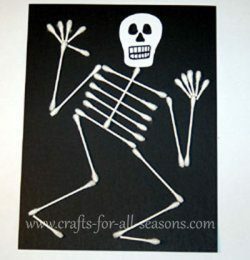 Q-Tip Skeletons – This is a super easy craft that your kids will make out of Q-tips, paper, and glue. Have fun arranging the skeleton in different positions, or make a scene of a few dancing skeletons in top hats! You’re only limited by your imagination! 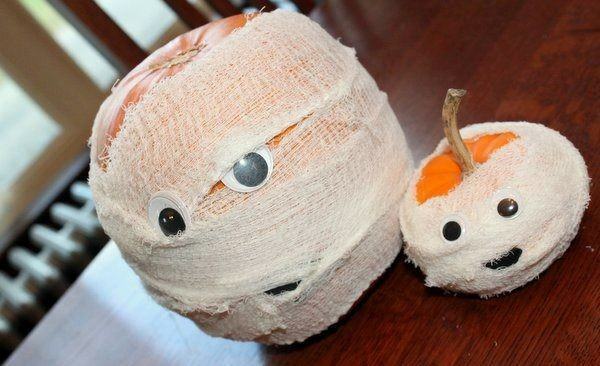 Pumpkin Mummies– This is another super easy craft for kids that involves wrapping a small pumpkin in gauze and attaching googly eyes and a small section for the mouth. Not super spooky, but incredibly fun, festive, and perfect for your porch! Potato Skull Stamps – Carving potatoes into shape is an awesome way to get that perfect skull shape. You’ll want to help the kids carve the potatoes, but then they can go crazy stamping treat bags or other decorations! 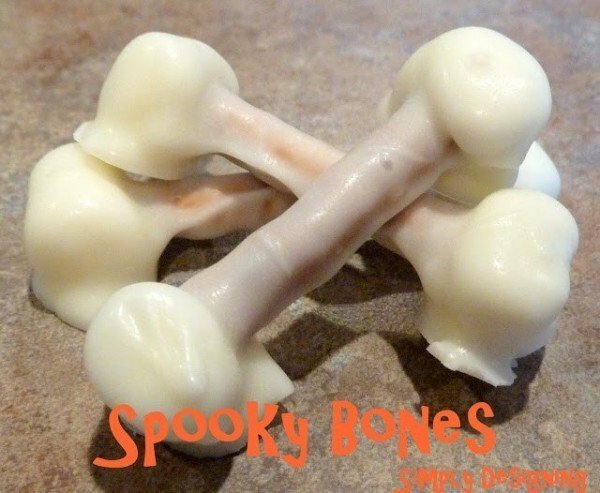 Spooky Edible Bone Treats – These marshmallow, pretzel stick and white chocolate “bones” are the perfect little treat for a Halloween party. 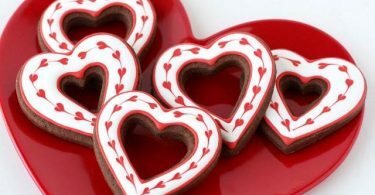 The kids can help by sticking the mini marshmallows onto the ends of each pretzel stick, while mom or dad should handle dipping the bones in chocolate. 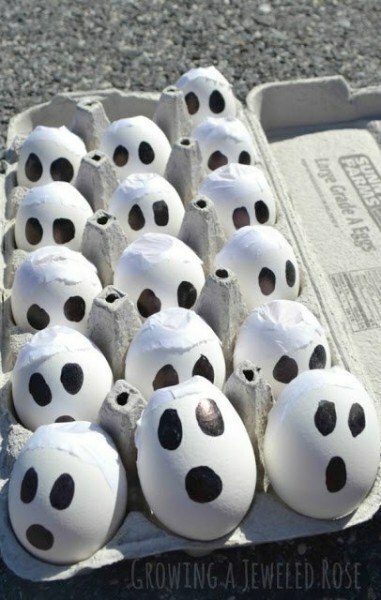 Smoking Boo Bombs – While the smoking cloud these little eggs give off aren’t enough to cause any major mischief, they will be super fun for your kids to toss and “disappear.” Pair with a ninja costume for some real fun! 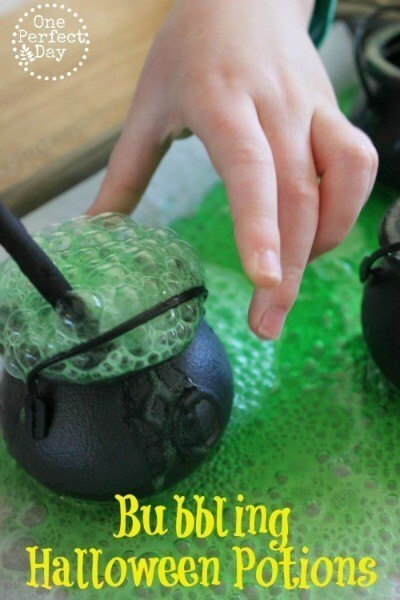 Bubbling Halloween Potions – This is a festive take on the classic vinegar and baking soda experiment that will have all of your mini witches’ cauldrons bubbling over with a mysterious green potion! 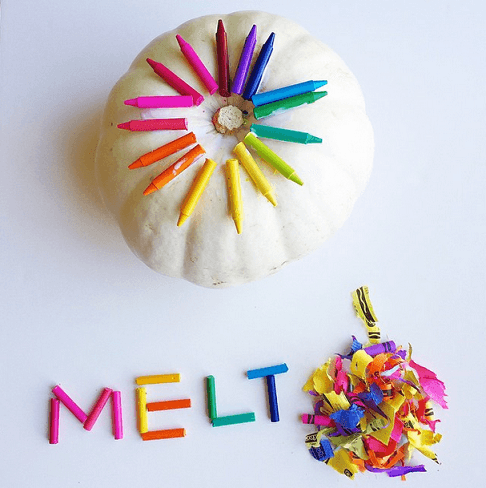 Melted Crayon Pumpkins – This is a simple but colorful way to decorate a pumpkin. Arrange your crayons, with labels stripped off, on top of the pumpkin. Use a hair dryer to slowly melt the crayons and create a lovely rainbow pumpkin design! 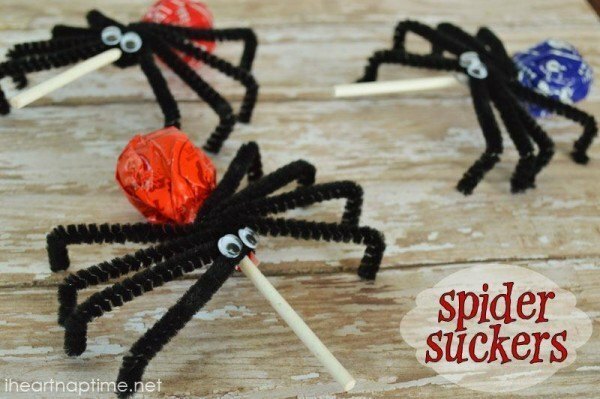 Spider Suckers – Use pipe cleaners and googly eyes to wrap around tootsie pops or other suckers and create festive, fun spider suckers to have at a party or to give out during Trick-Or-Treating! 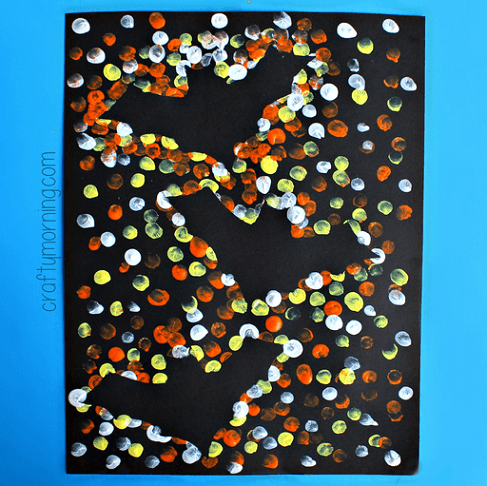 Fingerprint Bats – Cut out bat-shaped stencils and tape to a piece of black paper with painters tape, then let the kids go hog wild with placing dots of orange, yellow, and white on the paper. After it’s dry, peel the tape up to reveal their bats! 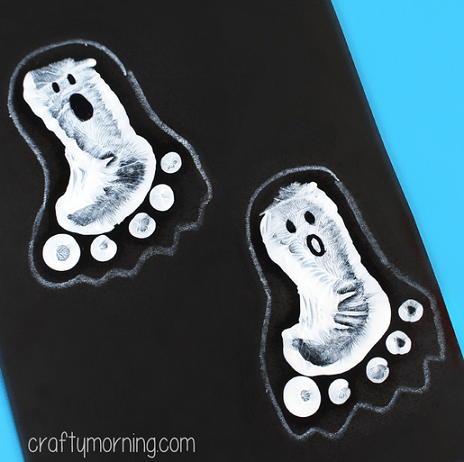 Footprint Ghosts – This is a fun one for young kids. Use those little feet to make the shape of a ghost, then outline with white crayon and add a face! 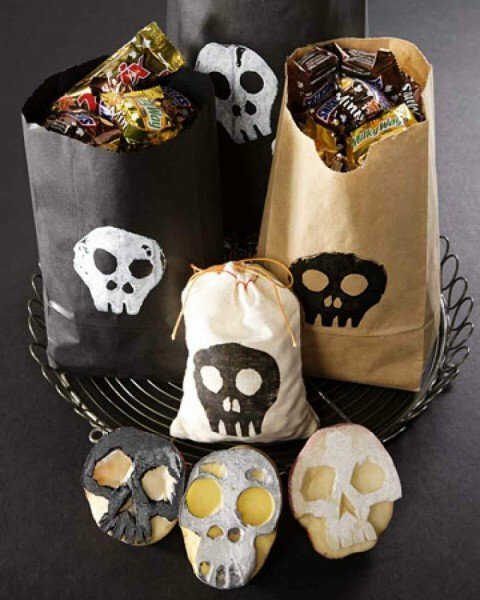 DIY Trick-Or-Treat Bags – Help the kids create their very own unique Trick-Or-Treat bag that’s large enough for all their loot! 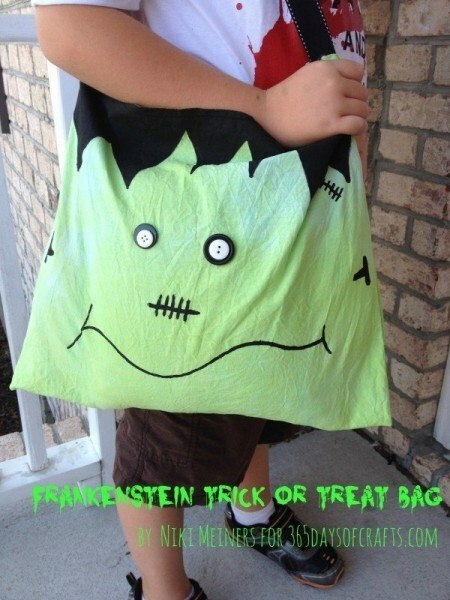 The tutorial includes Frankenstein and Pumpkin bags, but you can create anything their heart desires! 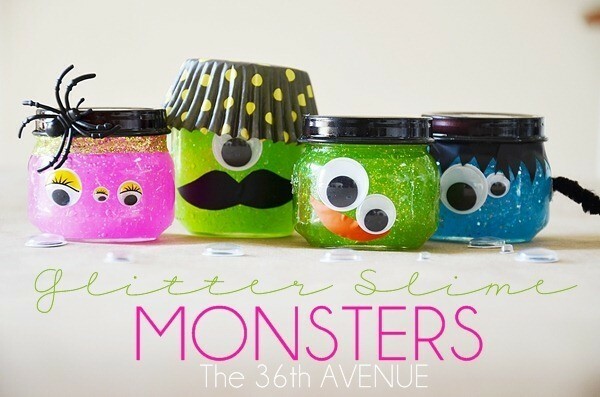 Glitter Monster Slime – Goopy, gross slime is a staple of Halloween, so why not decorate the jars as monsters and make it just that much more festive? 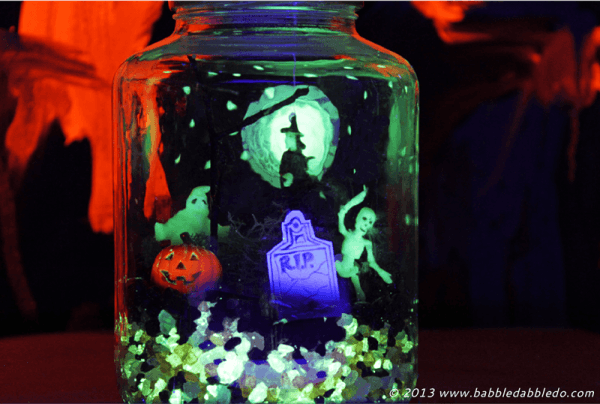 Glow-In-The-Dark Terror-arium – This is a great display piece both during the day and at night when it starts to glow. Construct the spookiest scene you can imagine, then watch it light up as the sun goes down! 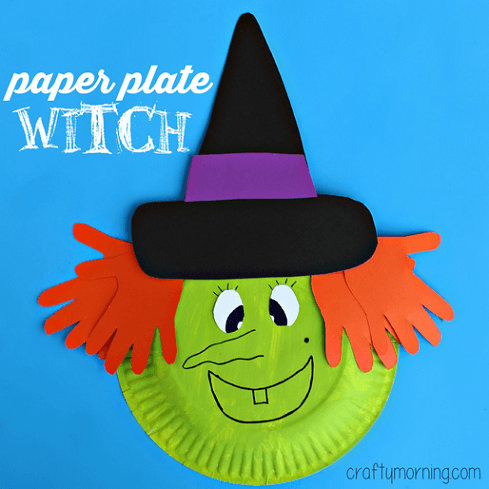 Paper Plate Witch – Use a paper plate and some construction paper to make a witch! Give her crazy hair, warts, a long nose, or a bright smile! 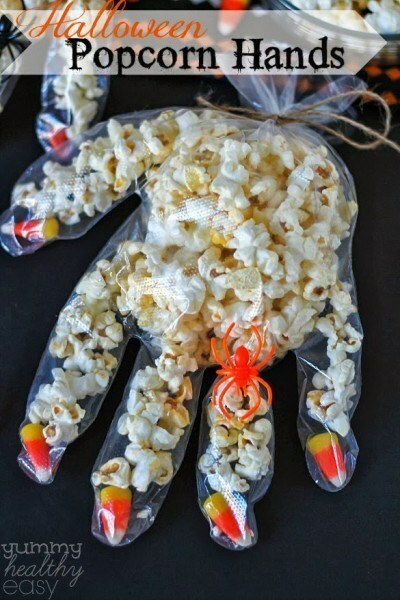 Popcorn Hands – This is another fun treat to put together to give out as a fun treat during Trick-Or-Treating. Healthy popcorn with five pieces of candy corn all wrapped up and secured with a bit of twine. 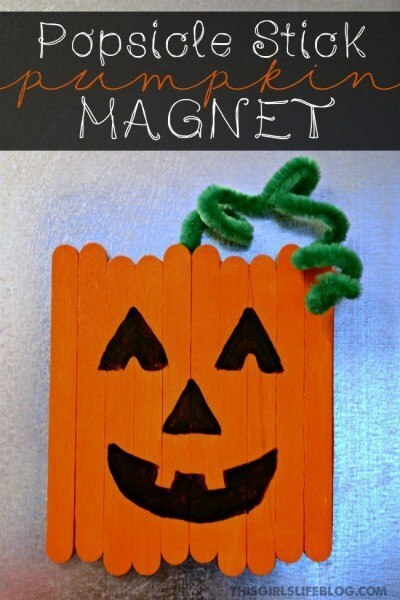 Popsicle Stick Pumpkin Magnet – Use popsicle sticks, paint, and pipe cleaners to make a jolly pumpkin magnet to hang up a few of the other fun paper projects on this list on the refrigerator! 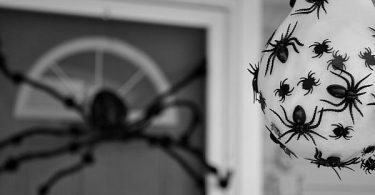 Spider Headband – Spiders don’t have to be spooky! 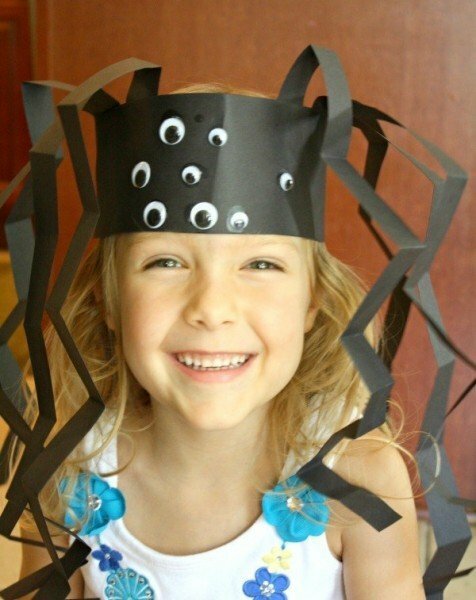 Make the kids a fun paper spider hat with multiple eyes and wiggly legs to run around in! 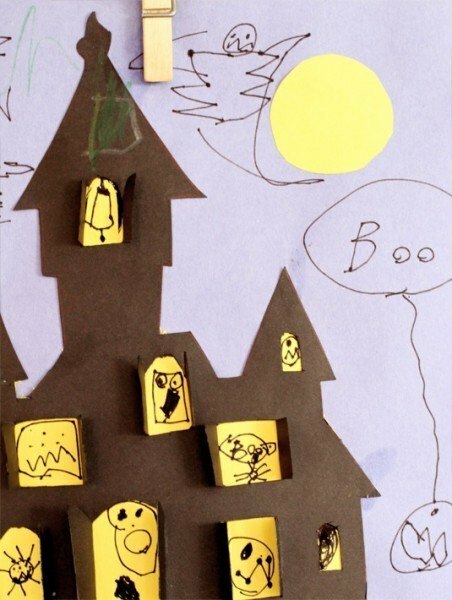 Haunted House Cut-Out – You’ll want to help out with this project, since it requires you to use an exacto-knife to cut open the little doors and windows of this spooky haunted house. Afterwards, have the kids draw all the monsters and spooky scenery! 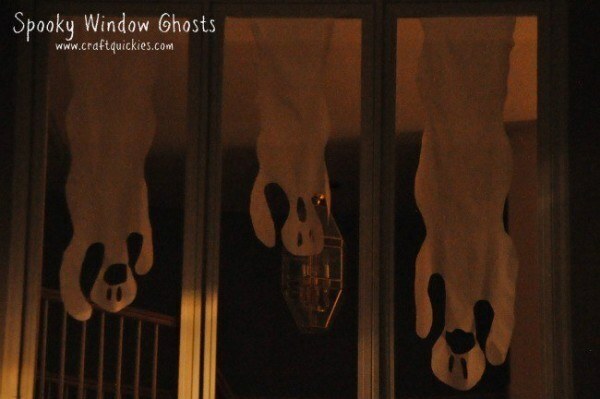 DIY Window Ghosts – These paper cutout ghosts are super spooky, especially when the moonlight catches them and reflects them onto the indoor walls! 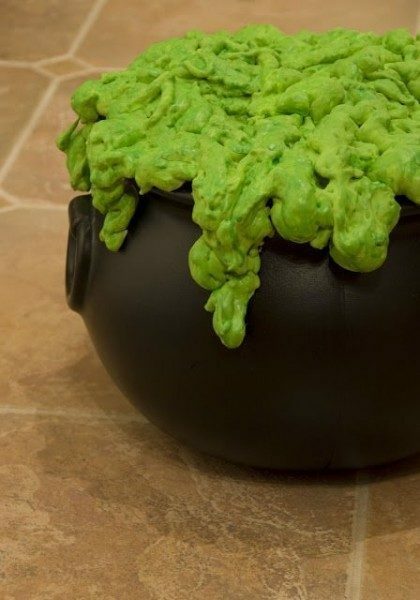 Bubbling Cauldron Outdoor Decoration – This spooky cauldron overflowing with witches’ brew is an easy DIY using a cheap dollar store cauldron decoration, insulating foam, and spray paint!